(SitNews) Ketchikan, Alaska - Fifty years ago, the Stena Danica and the Stena Brittanica were the newest ships in the Swedish ferry giant Stena Lines fleet. But both proved to have short lives in that busy fleet and both eventually would make their way to the Alaska/Canada northwest coast, where under different names they would make their marks. The Stena Brittanica would be rebadged the Wickersham and become, at least briefly, the "queen" of the Alaska Marine Highway System. The Stena Danica would also become a queen. She would sail for three decades as the BC Ferries "Queen of the North." The Stena Line is one of the largest ferry companies in the world with more than 30 ships, operating 20 different ferry routes between Sweden, Denmark, Germany, Ireland, Latvia, The Netherlands, Norway, Poland and the United Kingdom. It was formed in 1962 and by the late 1960s the Stena Line already had 12 ferries serving a variety of Northwest European cities. The Stena Brittanica came on line in 1967. It served the rapidly expanding Stena Line for two years before it was sold for just under $7 million to the State of Alaska which was looking for an "ocean going" ferry to make runs between Southeast Alaska and Seattle. Photo from an open ship on May 31, 1980, as the Queen of the North began service on BC Ferries' Inside Passage route. The Stena Danica came on line in 1969 and was the second ship to be named Stena Danica. it would spend five years in Europe before making a permanent trip across the Atlantic. The Stena Brittanic was originally built by AG Weser I Bremerhaven, Germany in 1969 at a cost of $11.3 million. It operated on the route between Gothenburg, Sweden and Frederikshavn, Denmark. In 1974, BC Ferries purchased the vessel for $13.8 million. The Stena Danica was then renamed the Queen of Surrey and began operating between Horseshoe Bay near Vancouver and Nanaimo on Vancouver Island. But soon it became apparent the ship was not well designed for the short haul run that involved four daily roundtrips. In 1976, the ship was taken out of service. The Queen of Surrey would remain at the dock in Vancouver for nearly four years as BC Ferries decided between selling the ship or refitting it for a different route. Eventually, it was decided to spend $10 million and turn the Queen of Surrey into long haul ferry that would operate between Port Hardy and Prince Rupert in Northern BC. The ship would also service smaller communities like Bella Bella and the Queen Charlotte Islands. In May of 1980, the newly renamed Queen of the North (with added staterooms, restaurants and expanded cargo capacity) went into service. 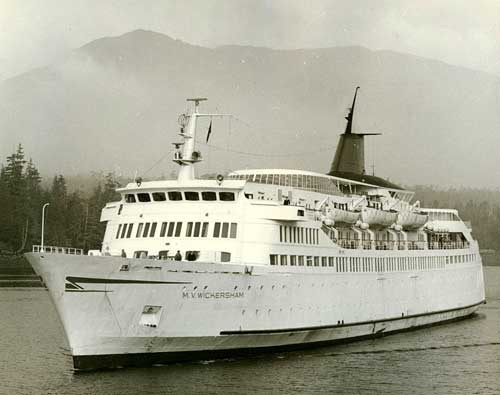 In 1985, she was designated as the "flagship" of the BC Ferries fleet and served for more than two additional decades. 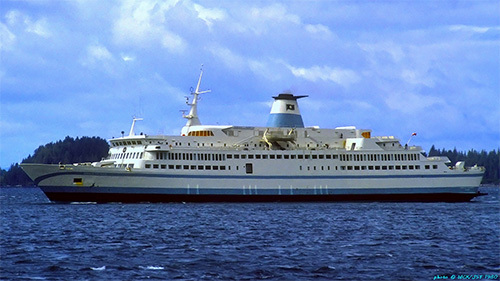 In 1994, the Queen's three decade old design was questioned when a similar ferry - the MS Estonia - sank with great loss of life in the Baltic Sea. Both ships were so called Ro-Ro ships in which vehicles entered from one end and exited at the other. The bows of the ships lifted up for access to the car deck, but that very feature on the Estonia caused the bow to come loose during a storm and more than 850 people drowned. BC Ferries spent several hundred thousand dollars to add a second set of welded doors in the bow to prevent flooding in high seas. Then in 2001, the ship was given another major refit, even though it was announced that a replacement ferry was being planned and the Queen of the North would be permanently replaced in 2009. The main problem with the Queen of the North's original design was that it was not designed to withstand significant flooding like newer ships were. But before it could be replaced, the Queen of the North would suffer the worst accident to ever happen to the British Columbia ferry system. At 8 pm on March 21, 2006, it left Prince Rupert on its regular 274-mile, 20-hour run to Port Hardy. But a little more than 70 miles south of Prince Rupert, near midnight, the ship failed to make a course change entering Wright Sound and ran into Gil Island at 17 knots. The wreck damaged the ship's hull and it began to fill with water. Ninety minutes after grounding it sank in more than 1,400 feet of water in Wright Sound. Initially, it appeared that all the passengers and crew had been safely evacuated, many by residents of the nearby Native village of Hartley Bay. But eventually it was determined that two passengers, Shirley Rosette and Gerald Foisy of 100 Mile House, were missing and believed to have not left the ship before it went down. Their bodies were never recovered. The Queen's captain, Colin Henthorne, was off watch and asleep in his cabin at the time of the grounding. The second mate, Keven Hilton, was on break, leaving the fourth mate, Karl Hilgert in command of the ship. The ship was being steered at the time by quartermaster Karen Briker and that was where the investigation into why the ship failed to make required turn entering Wright Sound focused. Hilgert and Briker had been involved in a lengthy relationship that had began in 2005, even though both of them were in relationships with other people. They had ended their relationship only a few weeks before the fatal voyage. The March 21st trip was the first time they had sailed together since the break up and almost immediately there were rumors that they had been having a discussion of a personal nature at the time the ship failed to make its course change. A transportation board investigation found no evidence of so specific a discussion, but it did note that both Lilgert and Briker had been "distracted" on the bridge. When that information became public news media up and down the coast had a field day, running numerous stories focusing on what may or may not have been going on between the ex-lovers that led to the grounding. As the investigation was ongoing, BC Ferries initially held Captain Henthorne "responsible" for the sinking, primarily contending that he had not adequately trained the bridge crew how to use a newly installed radar system, and fired him in January of 2007. Then BC ferries also fired Lilgert, Briker and Hilton, in May of 2007, saying they had been less than cooperative with the investigation. Meanwhile, the families of Rosette and Foisy filed suit against the ferry system as did other passengers on the ship. All would eventually settle with BC Ferries for sums ranging from $5,000 to $200,000. Investigations by both BC Ferries and the federal government eventually chalked the grounding up to "human error." ROV footage of BC Ferries' Queen of the North's stern, courtesy of CA Transportation Safety Board. Includes footage of ROV retrieving computer and other items from bridge. Nearly four years after the grounding, on March 16, 2010, Lilgert was charged with two counts of criminal negligence causing death. It would be nearly three years before the case would go to trial on January 17, 2013. The prosecution contended that Lilgert had been distracted by conversations of a "personal nature." had neglected to issue the course changes to Briker and then had not noticed the ship was off course for more than 15 minutes before the grounding. Lilgert's defense focused on his contention that he had issued the orders to change course but that Briker had not followed through. After several breaks, the trial concluded in May of 2013. Lilgert was found guilty and sentenced to four years in jail. Lilgert unsuccessfully appealed the conviction and began serving his sentence in 2015. Meanwhile, BC Ferries replaced the Queen of the North with a Spanish ferry named the ship named the MV Sonia. It was renamed the Northern Adventure and went on line in 2007. It remains in service on the north coast. A new vessel, the Northern Explorer was built and went on the northern run in 2009. It replaced the aging Queen of Prince Rupert.